I got really excited when I received this a few days ago – if this party is attracting people from Winnipeg, we must be doing somthin’ right. Thanks for the email, this sounds like a great event and I’d be happy to submit some ideas. I’m currently in Winnipeg and could ship a piece down with simple instructions for installation. I’ve just started to mow through some ideas so I’ll I’d like to bounce some ideas off you this weekend by email. I’ve got access to a lazer cutter and am thinking of cutting recycled cardboard to create a layered/fluid stalagmite/stalactite piece. I was thinking of some sort of wall partition that could divide a space or create flow from one space to the other. Most likely the piece would be a hanging piece so I’d be nice to know what kind of mounting you think is appropriate. I’ll send along some drawings as soon as I get some time. Spent the night with vinyl masters DJ mo’chi, Marshall Drägun, and RICKY BIONIX (who will play at PULP) as they guided me through the events of Toronto’s underbelly house scene (mo’chi’s words, I think). Started at a cool little place with light fixtures made of glass jars and ended at a DJ party at a secret location. Oooooo, mysterious! I can tell you one thing, we’re gonna get some cool sound waves from these three cats. Got back at 5am, woke up 20 minutes ago and now this post is done, I think I can go have breakfast. Yesterday was a good day. I don’t, really. I have no idea what the vast majority of people who are interested in this project think about it, or even what they know about it. Did you know that anyone could get involved, for example? I ask this because I had a conversation yesterday with one of my friends from Carleton and was presented with that question. The truth is this party is a complicated project involving many aspects like design, marketing, networking, licensing, logistics, and others, and we could always use an extra face on the team. Note I say face – not an extra hand. We need faces, people, individuals with their own dreams and aspirations who want, just like people already on our team, to be a part of something great and exciting. Maybe I just wish more people could enjoy the series of victories we have had in the past few weeks – finding the right venue, getting submissions from students and professional artists (http://pulpartparty.ca/about/programme/), being invited to speak at Pechakucha, watching the number of unique visits on our website go up. We’re having so much fun with this. Yesterday Toronto’s Interior Design Show tweeted and posted about us – they simply love the concept so they spread the word. The first hour set a record high new entrees figure to the site and over about 30 hours we have had 200 new visits and sold more tickets. If you had a chance to see me yesterday, I was jumping up and down in my chair. It’s not about money – it’s about people getting together to do something crazy. So, really, what I am trying to say is – message us onF and email us from the site. Tell us what you think and if you want to have some active roles. Get involved in a project happening downtown in the largest city in Canada. What can you bring to the project? What skills or connections do you have? How will you shape this party if you had a chance? We sincerely want to know. My name’s Ammar and I’ve been asked to do the practically impossible: sell out a brand new party in a town saturated with cool parties–in less than two months. Rotem invited me to his facebook group about organizing a fundraiser for Architecture for Humanity. At first, I was annoyed at the notifications so I turned them off. But the group’s posts kept popping up in my news feed and I occasionally threw in a comment or two about what the name should be, or how they should go about getting the word out. My interest was piqued, though I was still not particularly excited. But as the days went on, I got a sense of the vision Rotem had of a party like Ottawa’s Kosmic. His vision started to infect me, too. He figured out I knew a thing or two about marketing and decided to come over on the first Sunday of March to talk it over. We spent 5 hours together that day. 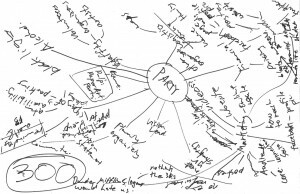 We used large 11×17 sheets of paper to brainstorm and mind-map the party. We did a lot of focusing on the essentials and crafting a clear vision for the party. Ultimately, I think I can say this is going to share a family resemblance with Kosmic, but it’s going to be a totally different beast. This is a new kind of party. It’s an art show with no pretentiousness; no sterile, “minimalist” aesthetic. It’s an art show where you can touch the art and draw on the walls and write on the tables (if they’re made of paper, please don’t damage wood or metal furniture). It’s an art show set in an awesome venue that’s just as messy as the process of making art with a really sweet retro aesthetic. I’ve been calling it an “art show”, but it’s really not–it’s an “art make”. And that’s just plain cool. The danger with writing an article like this is that it can really come back to bite me in the behind. Everything lives forever on the internet and if this party isn’t a success cause we didn’t get enough people, this post could haunt me for the rest of my life. But I don’t think that’s going to happen. There’s something inevitable about this being a success. I can’t quite describe it, but I’ve rarely been involved in a project where there’s very little doubt that it’s gonna happy and work out. Maybe it’s because this party is just so undeniably attractive. People want to come to this party. That makes my job so much easier. We just have to get the word out to enough people. It would basically be a long sheet of paper with a comic strip drawn on. A cardboard tube would be glued to each end of the sheet, making it look like a very large scroll. 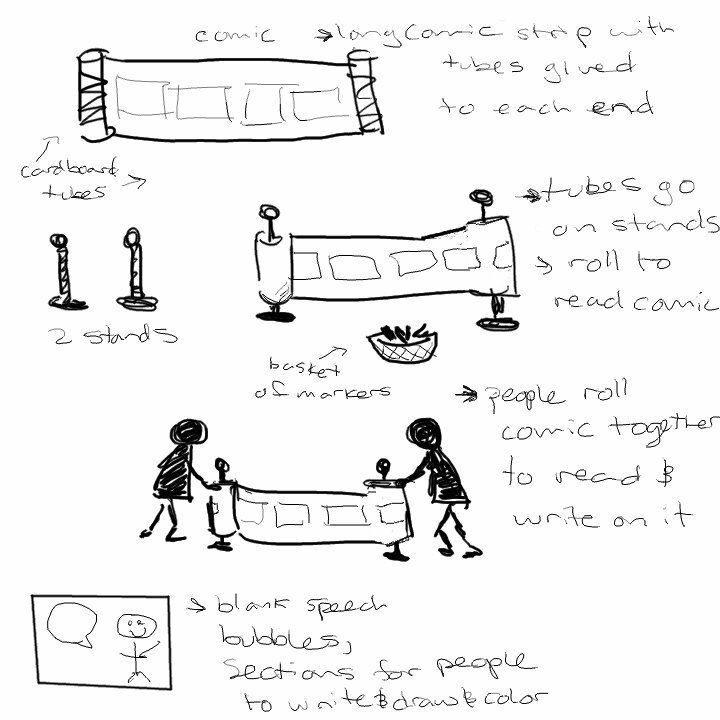 The tubes would both go on a stand where they can be rolled to move the comic strip along. It would require two people to roll the paper. Sections of the comic will be left blank for people to add in colour, drawings, text and other details. A basket of markers will sit nearby so people will know to make additions. The comic will be non-linear so that it doesn’t require a beginning and an end; people can start reading or drawing wherever they want. If space is an issue the comic can also be laid down on a long table. We’ve got a few more, we need plenty more. Keep them coming! People promised to send me sketches and designs soon. I have a few ideas of my own for installations but haven’t made them yet. So what we have right now, a month and a half before the party, is a space and music and a bar and a lot of people who are really excited to see what happens. We have created the staging area, now I need all of you to fill it with ideas. Totally unexpected and a great boost to the team effort – Pechakucha became interested in our party and invited us to their next event on March 19th at Gladstone Hotel. Are you excited? I’m excited. Are you excited? Couple more of those and some funky beat and we’ll have a one minute video to promote this event. 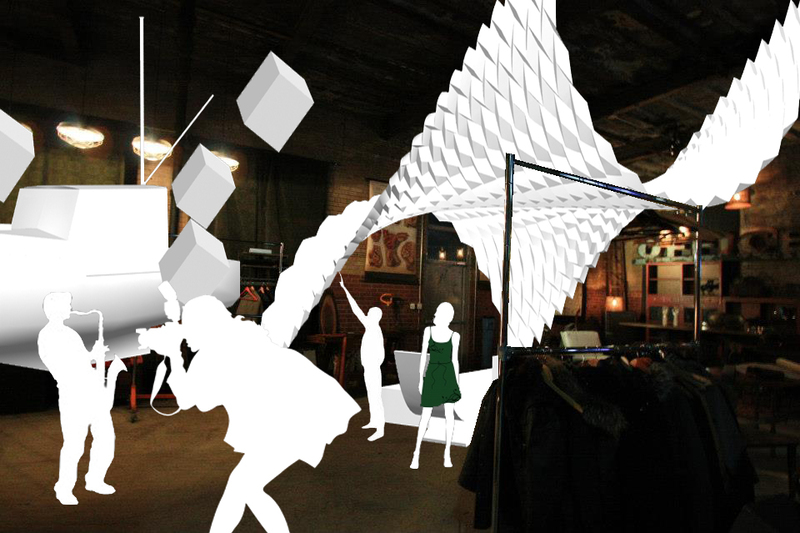 PULP: paper art party is taking shape fast and I want to tell a little about the experience. You see, this isn’t just a bunch of people getting together to create an event. This is becoming a real community collaboration with different people from different disciplines contributing time and effort to make this work. And it is, I think, because people understand that this is a chance to take part in something where you really get to have a voice and help shape a concrete outcome – a very fun night that we hope will return again next year. That’s how Eva, Andrea, Aoife, and Chole (whom I’ve never met before two weeks ago) are now working hard at obtaining blue-bin materials and finding sponsors. They are brainstorming different strategies and getting in touch with businesses who may want to get involved with the party. They got in when they read about the event on the Architecture For Humanity Toronto website and got excited, showed up at the AFHTO meeting we had two weeks ago, and got immediately got busy. Just try to stop them. That’s how Ammar, who is not a designer, decided to make this website and help with marketing. I came by his house one day to ask for advice, I didn’t even think he’ll volunteer to help. But he got so excited we spent five hours talking and he spent dozens of hours since coding and troubleshooting. We have students interested in this in Waterloo, Ryerson, OCAD, and U of T, we got musicians who want to come and perform, professional designers who want to build installations alongside students, hey – we even got a food truck to show up and serve delicious pulled pork sandwiches! (more on that soon). But this isn’t a closed circle – you can get involved. There’s plenty of things to do. So, submit a design! Or help us find materials and sponsors. Or maybe there’s something you thought about that we didn’t yet. Just hit the contact page. Or you can just get tickets now and show up a cool party! Or maybe you just wanna come to an awesome party created by people who really do give a damn. Let us know what you think!